Comfortable 18th century village house situated at the heart of the village of Quarante, in quiet no-through road. 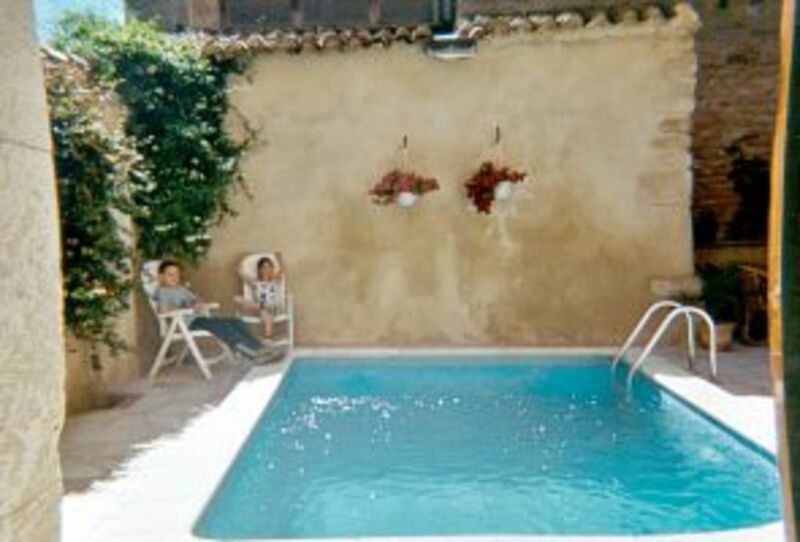 A gated, cobbled passageway, wide enough to garage a car, leads from the street to enclosed Mediterranean-style courtyard with small pool(5m x3m), and terrace area. The house was fully renovated in 1999 and is well maintained. Quarante is a lively, attractive village -shops, cafés, restaurants etc - set amidst gently rolling hills, vines, pine woods and copses. An ideal base for discovering this infinitely varied and beautiful region. Mediterranean - 19 miles. This is the most beautiful house, perfectly proportioned with all amenities needed to make it a home from home. The surrounding area provides opportunity to explore some traditional French life and of course sample some rather nice wine. I would recommend this property for families, couples or groups, first class! Wow! Thanks so much for this lovely review. I really enjoyed meeting you both and i'm so glad you had a good stay in our house and Quarante. Everything was great with a nice patio area and pool to spend your time outside. Lovely and private. The house had everything you needed and the games room was an added bonus for the kids. Great host and the village ideally situated for day trips and your bakery in the morning! We had a wonderful vacation in the historic town of Quarante. and gamesroom were truly inspiring and kept everyone entertained. The layout of rooms could be improved, and beds might be updated. Sarah was very helpful with suggestions on the local sights. Quarante was a perfect base to explore the Canal du Midi towns. Thanks for your review. I'm very happy that you enjoyed your stay at Quarante! We spent a week at the property with our two year old son and had a great time. The accommodation was fantastic inside and out and served our needs perfectly. We enjoyed visiting the local village, and the beach and airport (Beziers) are fairly close too. Overall, plenty to recommend and we would definitely go back. Thankyou for your review: always appreciated! I'm really pleased that you enjoyed your holiday, and hope to see you all (plus one!) again one day at Quarante. We spent a wonderful week in this fantastically equipped French home. It was our first visit to the Languedoc region and it was great to return to the comfort and tranquillity of the house after a day sightseeing. We particularly enjoyed the ambience of the courtyard and cooking on the BBQ after cooling down in the pool. Quarante is a lovely, quiet village with everything you need on your doorstep and the bonus of being able to walk to a very good restaurant - Le Terminus. Thank you very much for your lovely review, and I'm so pleased that you enjoyed your stay at the house and Quarante. And yes, we are lucky having such a good restaurant within walking distance. I hope we might have the pleasure of seeing you again at Quarante one day. Nous avons passé un excellent séjour dans votre maison.Nous sommes une famille de 2 adultes et 3 enfants de 10, 8 et 5 ans. Chacun a trouvé son plaisir et son espace dans cette belle maison dans un village calme et tranquille avec toutes les commodités (boulangerie,boucherie,petit magasin). Toute la famille a adoré et bien profitez de ces vacances. Nous conseillerons cette maison et y reviendrons. 19 miles inland from the Mediterranean, Quarante is situated west of Béziers in the Hérault departement, in the beautiful Languedoc region of France. -Long term rentals considered November to April €500 per month excluding heating charges. -20% deposit at the reservation -The balance 6 weeks before start of holiday -We accept payments by direct bank transfers, sterling cheques, french account euro cheques and Card payments are possible via Paypal (you only require a credit card and my e-mail address for this method of payment).